A ruling party MP in Russia has released a video clip where children enthusiastically sing of their willingness to "fight the final battle" for "Uncle Vova", hinting at President Vladimir Putin, according to the Kharkiv Human Rights Protection Group. They also promise to hold their ground in Crimea, which Russia has illegally annexed from Ukraine, but also to reclaim Alaska from the United States, KHPG reports. This is not the first such video where children in uniform are used for unadulterated propaganda. 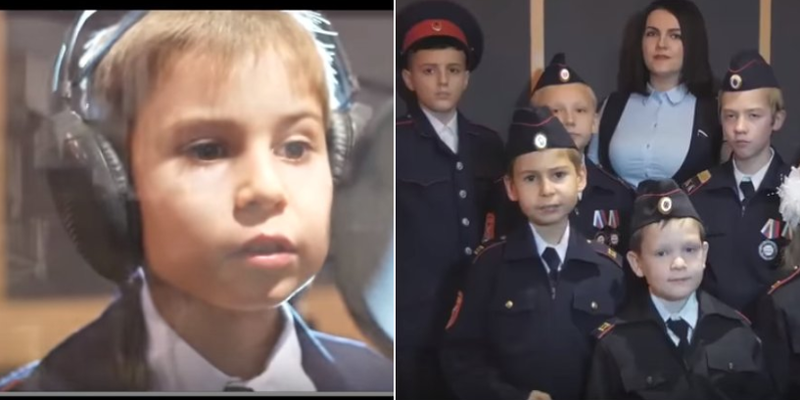 The clip has Anna Kuvychko, a new United Russia MP and a mastermind behind the video, singing together with young police cadets, some under 10, from School No. 44 in Volgograd. Lyrics and music are by Viacheslav Antonov, who is allegedly a taxi driver from Moscow oblast. His rendition, together with his young son, also has the lad leaping in to tell ‘Uncle Vova, we’re with you”. Kuvychko has embellished her clip with images from abroad, clearly intended to demonstrate the chaos reigning there, and the country ‘deprived of a President’. All of this is, of course, in contrast to the children singing together in the studio or against a background of historical sites, including Mamaev Kurgan and the memorial complex marking the pivotal Battle of Stalingrad during WWII. Read alsoUkrainian language out of curriculum in "DPR" schools - transition to Russian completedHere the children sing that while peace would be a good thing, “if the Chief Commander calls us to our final battle, we’re with you, Uncle Vova”. If the children may not fully understand what that ‘final battle’ suggests, "what about their parents?" KHPG asks. “The text of the song talks about difficult diplomatic relations on the international arena in which Russia is proving unwavering and is determinedly upholding its own vector of development, despite pressure. Moreover, the children, inspired by the example of Crimea, hope for the reunification [sic] of other originally Russian territories. “Now they have other, no less serious, challenges before them. But they will definitely make it through and be victorious,” Kuvychko says. Read alsoChildren in occupied Donbas used in Kremlin propaganda The Crimean Human Rights Group and others have long warned of the dangerous level of militarization in Crimea under Russian occupation, including through the use of children. During official Russian festivities in Sevastopol on the third anniversary of annexation, a choreographed piece was performed where girls sang the following lines: “My country, my fate, my dream, my war”. At that point, other children burst onto the stage waving around mock machine guns. In another piece, according to Liga.net, young girls dance around Russia’s statue glorifying the invader, bleating “Thank you” in unison. Read alsoKremlin's latest propaganda bogeymen: cartoon Scottish wizards and rip-off Harry PottersIt should be noted that Putin himself clearly has a taste for such demonstrations of adulation normally seen among totalitarian dictators. Children can be heard singing Putin’s praise in his presence here and while it is unclear how many online birthday greetings are real, the Russian media regularly produce sycophantic reports about Putin’s pet dog, his skiing and fishing skills, etc.